I got a live ticket of COLDCUT on 25th February in London. 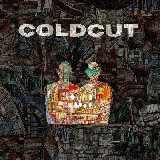 COLDCUT released a new CD named 'Sound Mirrors' last January, and they will perform in many countries include UK cities. I'm really looking forward to going this special live! It makes me exiting already!